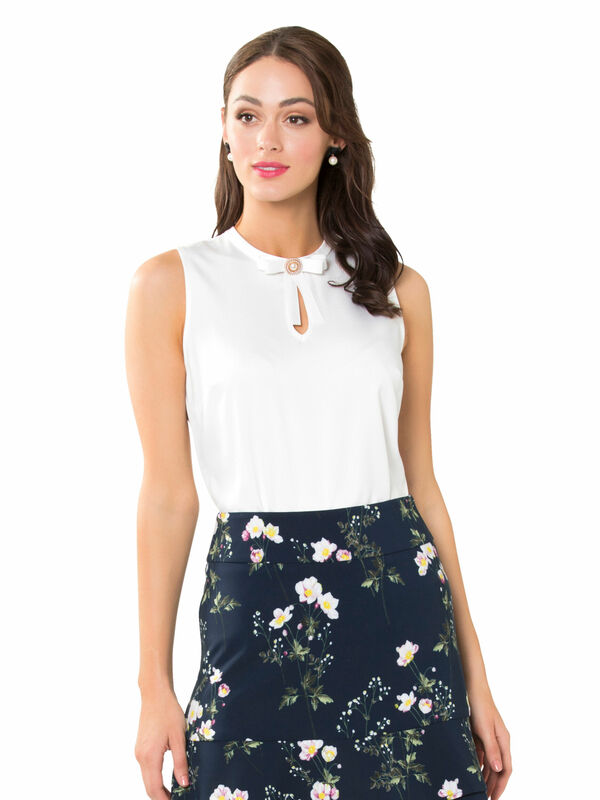 Talia Top https://www.review-australia.com/au/talia-top-cream/RE19TW013.RECRM001.html Take your trusted wardrobe staples up a notch with the ultra chic Talia Top. 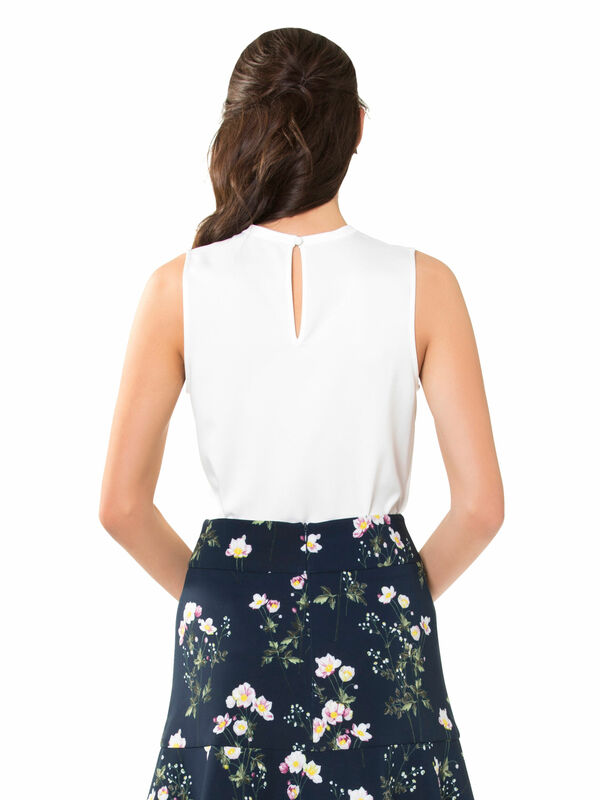 In a soft woven fabrication, this sleeveless top is the stylish answer to work, evening or events style dilemmas. It features a regular fit, round neckline with a band trim and keyhole cut-out and a matching grosgrain ribbon and pearl gem embellishment. Darting at the bust ensures an elevated finish. Talia Top is rated 4.9 out of 5 by 18. Rated 5 out of 5 by BrookeJ from Absolutely perfect! 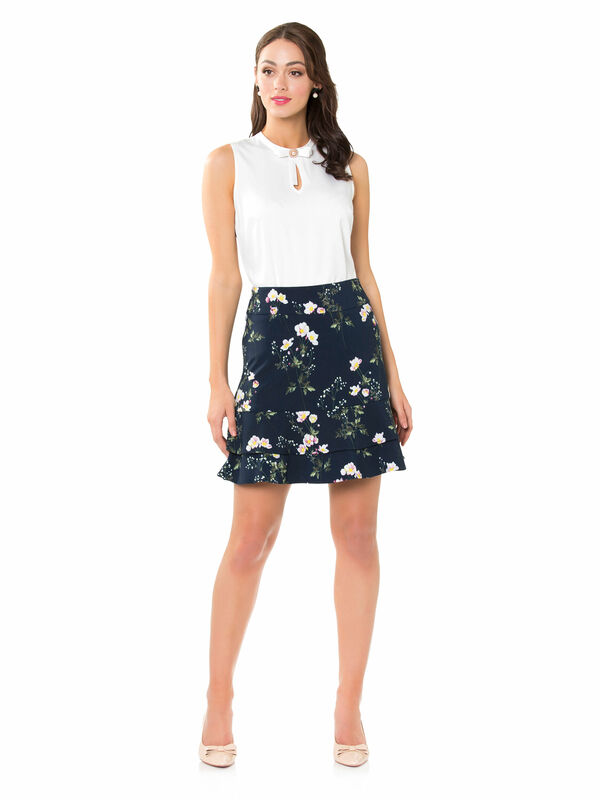 I purchased the Talia Top last night and it is my favorite already! It is perfectly versatile to wear to work or casually with jeans, and the pearl detail in the bow adds just that bit of glamour to any outfit. Definitely recommend. Rated 5 out of 5 by Kate4 from Classic and elegant This top works with just about every Review piece I own! The brooch is such a beautiful touch and makes it more than just another white top in my wardrobe. The material of the top itself is also lovely and not see through. Rated 5 out of 5 by Joyful from Such a stunning blouse with a dainty detail This blouse looks gorgeous on and I especially love the detachable brooch that comes with it at the neckline. It's summery in a classic white colour and goes with everything and is flattering. Rated 5 out of 5 by Binny from Love love love this top I bought this yesterday and I am so happy to get it. It’s so beautiful and versatile that it can be worn with almost any skirt, shorts or jeans. It’s my favourite top after the miss pearl top. Rated 5 out of 5 by Cutiemum from Very feminine Great sizing. Fits under armpits well. No gaping. Love the feminine detail of the neckline and simple but elegant piece of bling that can be removed when being washed. This is a big plus. Rated 5 out of 5 by Tess72 from Elegant top I just bought this top and I am glad that I did. It look pretty elegant and can go with any skirt. I got so addictive with Review now, I got to have one or more every month. Rated 5 out of 5 by JDBa from Great smart or casual top I’m very happy with this top, it goes with everything! Good to tuck in with skirts and jackets or wear loose with trousers, very versatile, I love it. Rated 5 out of 5 by Essem from Classic style Love this top. Beautiful fabric and style. Wearing it right now! Many positive comments about it, my favourite being it has a Chanel look.